Freed-Hardeman President David Shannon has announced that Chester County High School boys’ basketball coach and former Freed-Hardeman assistant Drew Stutts will take over the FHU men’s basketball program as its new head coach. Henderson, Tennessee (April 16, 2019)—Fifteen Freed-Hardeman University students have been inducted into Alpha Chi National Honor Scholarship Society this semester. Membership is by invitation only to juniors and seniors who have a minimum grade point average of 3.75 on at least 80 credit hours. NASCAR legend Dale Earnhardt Jr. will speak at Freed-Hardeman University’s annual benefit dinner Friday night, Dec. 6, 2019. The annual event raises funds for FHU scholarships. Social club Xi Chi Delta’s “How the West Was Won” claimed Makin’ Music 2019’s top prize Saturday night, April 6, 2019, at Freed-Hardeman University’s Loyd auditorium. Freed-Hardeman University is bringing out the music in everyone with the 42nd annual Makin’ Music show “The Music in Me.” Show times are Friday, April 5, 2019, at 7:30pm, and Saturday, April 6, at 2:00pm and 7:30pm in Loyd Auditorium. Freed-Hardeman University and Hickman County Schools have entered a partnership whereby students at Hickman County High School and East Hickman High School can enroll in classes at FHU to meet both high school and college requirements. The first courses, English Composition I and American History I, will be offered this fall. Mid-South Youth Camp, operated by Freed-Hardeman University for more than 50 years, has announced additions to its leadership team for Summer 2019. Tommie (T.J.) Kirk, principal of Chester County Middle School, and Darby Miskelly, guidance counselor at Jackson’s Rose Hill School, will join the existing team of Brad Montague (director) and Gayle McDonald (associate director) and Ally Rogers (junior camp and registration coordinator). Kirk will also be an associate director and Miskelly an assistant director. Freed-Hardeman University music professor Richard England presented two of his original piano “sketches” at the 40th annual conference of the College Music Society Southern Chapter February 28 - March 2, 2019. The University of Central Florida College of Arts and Humanities hosted the conference in Orlando. 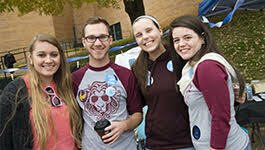 In a long-standing tradition, Freed-Hardeman University named the students who, in the view of students, faculty and staff, best represent the ideal FHU student. FHU Chancellor Milton Sewell conferred the honors. Freed-Hardeman University has announced the candidates for the title of Mr. and Miss FHU. Winners will be announced Tuesday, March 19, during the school’s 10:30am chapel service in Loyd Auditorium.